100% Whey Protein. The Real Heroes. Low Carb. Build Lean Muscle. 100% WPC. Supports Lean Mass. 20g of Protein per Serving. No Amino Spiking Ingredients. Low Carb. Build Lean Muscle. 100% Whey Protein. Whey consists of 100% concentrated whey protein, which ensures excellent lean mass gains with very low amounts of carbohydrates and fat. 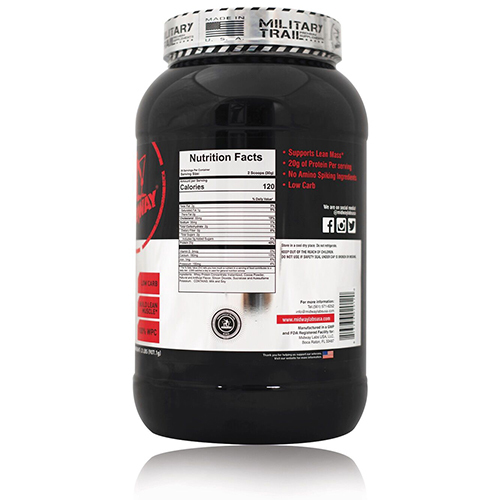 The use of this product provides the daily maximum anabolic state for athletes with intensive training. Say yes to quality protein and rest assured as Military Trail Whey Protein does not contain any Amino Spiking ingredients. Whey Protein Concentrate Instantized, Cocoa Powder, Natural and Artificial Flavor, Silicon Dioxide, Sucralose and Acesulfame Potassium. Contains: Milk and Soy. KEEP OUT OF THE REACH OF CHILDREN. Do not use if safety seal under cap is broken or missing. Store in a cool, dry place. Do not refrigerate.